PLEASE NOTE! 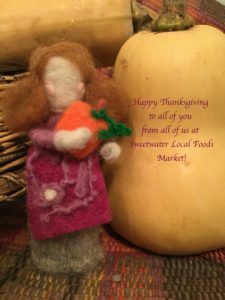 There will be NO MARKET on Saturday after Thanksgiving, November 24th! Our normal every Saturday schedule resumes after that. Thanks, and from all of us at Sweetwater we hope you all have a wonderful Thanksgiving! Empires, Golden Delicious and Ida Reds available this Saturday, Nov 17th.  Rich mild flavor when baked or cooked. We will also have Liam’s Knitted hats, scarfs, and pot scrubbers. We will also have eggs from our happy, pastured, heritage-breed hens. Looking forward to seeing friends old and new this Saturday! Please come inside to pay and get a receipt, and then pick up your turkey outside. Nitrate Free Hams & Hocks and limited bacon. ~ Fresh Organic Apple Pies – Crumb top made with organic oats OR a Traditional Apple Pie. Gluten Free or Regular. ~ Fresh Pumpkin Pie made with Grandson’s Farms Pie Pumpkins. Alisa makes an amazing pie!! Gluten Free or Regular . ~ Pumpkin Cheesecake with a Gingersnap Crust! Gluten Free or Regular. Microgreens! Lastly, We have radish and sunflower microgreens back this week! Looking forward to seeing you at the market! Gourds & Pumpkins – all sizes! Salad Mix – This week we will have a special Thanksgiving Salad Mix. A festive blend of our weekly salad mix but this week including delicious butter lettuce and beautiful micro mustard for a festive presentation for your Thanksgiving dinner table. Kale – Purple and Green Curly Kale. Spinach – Picked from the Hoophouse. Carrots – Sweet winter orange carrots. Rosemary – Fragrant rosemary bunches to flavor your holiday recipes. Table Arrangements – Bunches of Stock Flowers, Eucalyptus, and Apple Branches to dress up your Thanksgiving table. Please contact us to be certain we bring enough of what you want! We appreciate orders and your beef is at market when you get there, a win win situation. We’ll bring a nice selection of honey. Honey substitutes beautifully for refined sugar in your favorite holiday recipes. Please note: There will be NO Market on November 24th. Veggies this week: Onions, Garlic, Celeriac, Cabbage. Rosemary and Sage. We have quarters of beef available. They range in price from $616 to $648, cut, wrapped and frozen, picked up at the Farm!. Say THANK YOU to your Thanksgiving host/hostess with some delicious treats! -Caramel Ganache Tarts (4″ or 9″ available for pre-order and pick up Wednesday)….and MORE! Wed. 11/21 at The Cheese Lady in Muskegon. I hope to have some new seasonal products ready for you, as well as the usual favorites. Teas, vinegars, honeys, herbal extracts and completely toxin free body care products. Customer appreciation day winners, see below. Prizes can still be collected at the Info Booth. Please check at the info booth; if your name was drawn and that vendor is on site you can still collect your prize. We’ll continue to do this for a few more weeks. 1.This meleagro has a large furcula and you can buy one from which vendor? 2. If you want to make a graskersbaka how many vendors would you have to choose from for the main ingredient? 3. If you decide to skip the baking and buy a kukurbo kukajo how many vendors do you have to choose from?